Are you wondering if you should make your child play sports? Many parents are not too sure if it's right to enroll their kids in sports between the ages of 2- 5 years. Different parents have different philosophies about sports. According to studies, it is always better to observe your kid's interest in sports and then enroll him/her according to his/her interest rather than forcing something on them. On the other hand, if you restrict your kid from playing sports thinking he is too young for it, then watch out... you may be discouraging your kid, and this can end up with him being less confident in his future years. Playing sports have several other benefits like development of motor skills, eye and hand/leg co-ordination, balance and development of an attitude that is positive. Many children need the right environment to make a start. They may have to be with other children to get influenced into trying a hand at some sport. You can encourage your kid by taking your kid on a family picnic or a weekend visit to a park. You can start with simple games like catch-catch or hide and seek and slowly move to a game like cricket or foot ball. You will see how your child will start emulating others and gradually develop an interest to play the sport. • Age: Some sports programs for children start enrolling kids by the age of 2-3 years. Individual sports like swimming and gymnastics are best for kids between the age group of 3-5years. Identify the sport based on what your child is interested in and what he is capable of doing at that age. • Temperament: Playing in a team requires your kid to be patient be able to follow instructions and have the right temperament. Although all children do not have this temperament, being involved in sports help them develop it eventually. 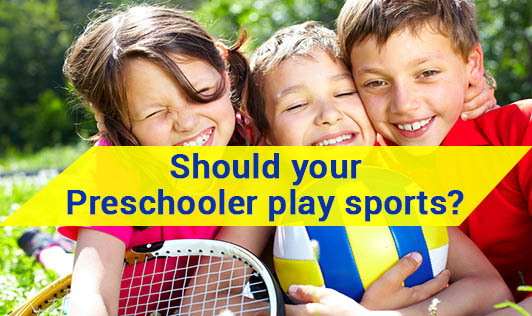 • Interest: Has your child expressed a desire to play a sport? While some kids don't realize that sports exist, some others are aware of it. It is the parent's responsibility to identify the sport that their child may be interested in and direct it with encouragement and motivation. No matter what you decide, it would ultimately aim at keeping your kid occupied and active. If your heart is set on your child taking up a sport and he is reluctant, then wait till he grows up and is more confident and enthusiastic, so that you can see him enjoy and learn the sport in the best way!